8x6 oil on canvas mounted on a RayMar panel ready to frame. I love these flowers the way they pop up and the stem attaches to the base is so different. 8x6 oil on canvas mounted on hardboard ready to frame. I am doing a series of floral watercolors and thought it might be fun to do some in oil also. 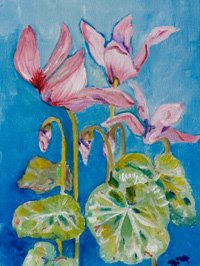 So for the next few days I will be posting small floral paintings. I went into the woods behind my house yesterday and painted these sweet little dandelions. It was a chilly day and I had dressed warm, two coats for the early morning painting. The trees in the woods blocked the wind and the sunny little spot I found to paint in were very warm and protected, a cozy little hideaway. I had only painted a few minutes when I had to take off my coat. The woods were in bloom with wild flowers but the dandelions caught my eye so I painted them. Unlike most of my daily 6x8 paintings this one is huge. It is 30x40 on gallery wrapped canvas. The sides are painted and the back in wired ready to hang or it can be framed. Give and Take oil on gallery wrapped stretched canvas with painted sides. The back is wired and it is ready to hang.The painting is done in Burnt Umber. I was raised on a dairy farm in Michigan. The only kind of milk my father sold was Grade A. One of my jobs as a kid was cleaning the big silver tank that held the milk and cooled it down until the semi truck came from the creamery to pick it up. This Abstract Landscape painting is filled with warm colors. This is a large painting 30x30 and would be a wonderful addition to your collection. My tulips are still in bloom here in Michigan. It has been a cool spring but the flowers love it. This painting a day number 129 for 2008. A Passion for Red painting a day. Cherries swing in the sky waiting for you. Enjoy their sweet tast. 6x6x1 1/2 oil on gallery wrapped stretched canvas. The sides are painted and it is ready to hang. Eggplants and Lemons make a great still life with the dark purple of the eggplant and the great yellow of the lemons. Eggplant and Lemons oil on gallery wrapped stretched canvas. Spring blossoms here in Michigan. Every tree is in bloom. I like the pink ones best, but they are all wonderful after a long winter. Painting a day number 123 for 2008. Nice sliced tomatoes ready to eat. gallery wrapped oil painting with painted sides, wired and ready to hang. I am celebrating to night with a little wine, well almost wine in this painting. This is a painting of a vineyard in the north of Virginia. When I travel I always try to vi site the local vineyards and sample some of the wine that is available. Flying makes taking wine home difficult but not un doable and now most vineyards are able to ship to other states. I have always felt it is crazy to import wine from other countries and not be able to buy wine from the next state. Tonight I toast the great wine we have here in the US and the wonderful Alyson Stanfield's Artist Breakthrough program. The tomatoe is native to western South America and Central America. In 1519, Cortez discovered tomatoes growing in Montezuma's gardens and brought seeds back to Europe where they were planted as ornamental curiosities, but not eaten. Most likely the first variety to reach Europe was yellow in color, since in Spain and Italy they were known as pomi d'oro, meaning yellow apples. Italy was the first to embrace and cultivate the tomatoe outside South America. The French referred to the tomatoe as pommes d'amour, or love apples, as they thought them to have stimulating aphrodisiacal properties. In 1897, soup mogul Joseph Campbell came out with condensed tomatoe soup, a move that set the company on the road to wealth as well as further endearing the tomato to the general public. Campbell may have made tomato soup popular, but the first recipe is credited to Maria Parloa whose 1872 book The Appledore Cook Book describes her tomatoe chowder. 8x10 oil on hardboard ready to frame in a standard frame.